Kaiba, the president of KaibaCorp, can't handle the fact that he was once made a mockery of by Yugi's alter ego. Naturally, he's planning an elaborate revenge game meant to destroy Yugi and his friends. The game shall be played at Kaiba Land on the day of its grand opening. Featuring only the best of the best when it comes to cutting edge technology, Kaiba Land takes 3D to the limit and features the kind of games that would make the host of the The Running Man squirm a bit in discomfort. By ensnaring Yugi's grandfather and forcing him to a game of Duel Monsters using his virtual reality simulation, Kaiba's plan at revenge is only just beginning. Normally Mutou Sugoroku would have a shot at winning this duel thank to his Blue-Eyes White Dragon, but Kaiba reveals that he now has three Blue-Eyes White Dragons of his own. 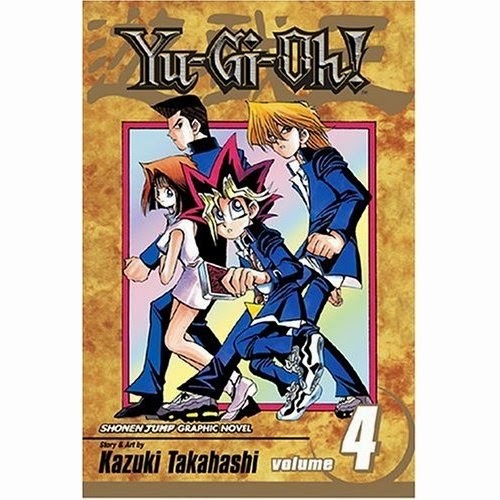 With the duel in hand Kaiba keeps his simulation going with the hopes of driving Sugoroku insane, but he offers Yugi a chance to rescue his grandfather. If Yugi and his friends face the "hidden attraction" of Kaiba Land know simply as "Death-T" then he'll stop the simulation. Yugi accepts this offer and the fun stuff begins. There are quite a few macabre games involving Death-T, but my favorite is the Murderer's Mansion. The Chopman is a killer who slashed ten boy scouts into pieces all in one night and Kaiba makes it known that the killer is hiding somewhere in the Murderer's Mansion. Yugi and his friends not only have to manage to avoid the brutal killer, but they must somehow escape a giant guillotine that will severe their hands unless Yugi can guess which lever will free them. I could definitely sense some horror vibes from this entry. In fact, the series as a whole up this point has a bit of a playful and yet macabre sense storytelling. I think that's probably why I have such an appreciation for it. The gang's struggle against Death-T isn't resolved in this volume and so it will be on to volume five for me. Can't wait.